How amazing and yummy is this? Yay Stumptown Coffee! Give Stumptown Coffee Roasters points for style. The small-batch roaster just started selling cold-brewed coffee in dark amber glass bottles — stubbies — that look as if they belong in a cooler on the porch. The coffee itself is delicious, sweet and clean, and drinking it from a stubby makes a difference. Even though it’s chilled there’s no ice, so the flavor is pure and undiluted. 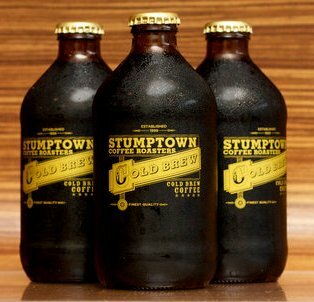 (Right now Stumptown is only bottling cold-brewed House Blend; single origin coffees will be offered this summer.) The bottle has a heft that feels good in the hand, and the shape of it triggers an involuntary shift in posture — shoulders open, arm cocked to half-mast, weight shifted to one leg. It’s hard to be uptight with a stubby. Then there’s the obvious: it simply looks good. This morning, I met up with a friend who was taking his daughter to school and popped open a couple of stubbies for the walk down West 13th Street, finishing them off as a stream of toddlers surged past us. It felt much more satisfying than sipping iced coffee through a straw sticking out of a sweaty cup. But really, Sorenson is playfully plumbing his youth — the stubby as madeline. The inspiration for the bottle comes from the Olympia Brewing Company (slogan: “It’s the water”), a Pacific Northwest institution that shuttered in 2003. “My daddy had stubbies in the crisper, where you’re supposed to keep vegetables,” Sorenson said. “It was filled with stubbies.” His whole childhood was filled with stubbies instead of iceberg lettuce. Right now the stubbies are only available at Stumptown locations in Portland, Ore. Starting next month the bottles, which are made in Portland, will be shipped to a Stumptown roaster in Red Hook, Brooklyn, to be filled there. Soon New Yorkers can start the morning with a stubby from the fridge. (There are already refillable growlers of cold-brewed coffee appearing in and around town.) The best part of waking up is reaching for the bottle opener. $3.50 for a 10.5-ounce bottle. Currently only available at Stumptown Coffee Roasters locations in Portland, Ore.; should be available at New York locations by July 1.